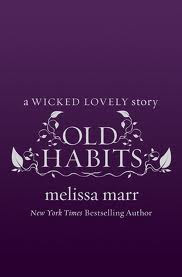 Old Habits was written by Melissa Marr. It is a "short" from the Wicked Lovely series. Recently anointed king of the Dark Court, Niall struggles to forge a new relationship with his subjects—and with the former Dark King, Irial, his once-friend, once-enemy, and now possible-advisor. The story is set in time between Ink Exchange and Fragile Eternity (which I read and reviewed last summer). I have to say I just love that Melissa Marr went back and added short stories between full novels. It was a short and pretty quick read, but since it had been a year since I had read the other books in the Wicked Lovely series it did take some thinking and remembering. Once I realized what had happened before and after this story it was a really great addition. I really enjoyed the fuller character development. I would highly suggest readying this story while the other books are still fresh in your mind (and even read it in the "correct" sequence rather than the written/published sequence).